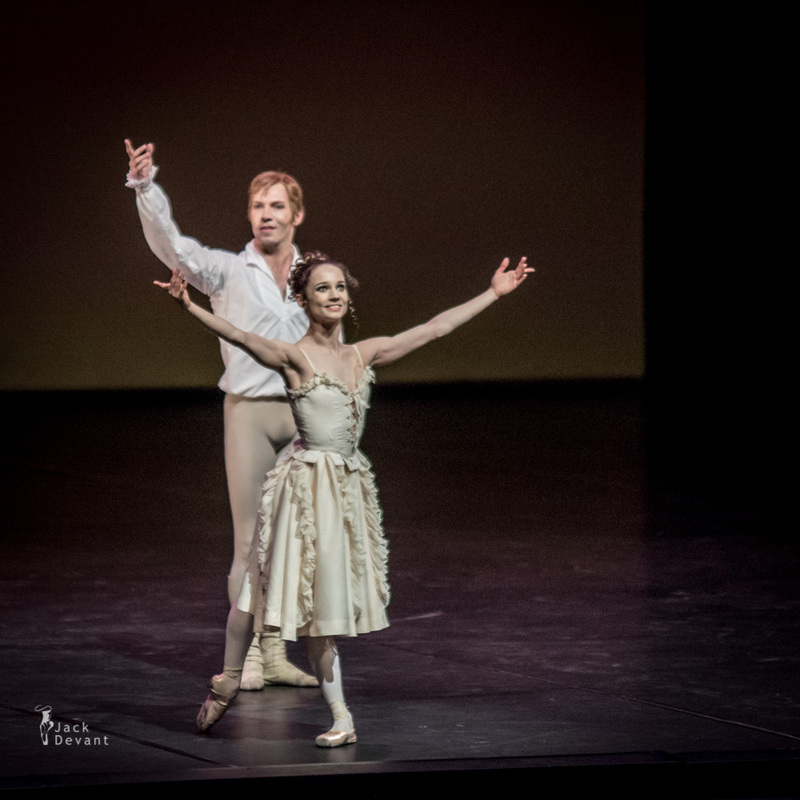 Maria Kochetkova and Johan Kobborg in Manon pdd, music by Jules Massenet, choreography by Sir Kenneth Macmillan. Kenneth and Friends Gala 2014 at Finnish National Opera. Shot on 24.05.2014. Maria Kochetkova is currently Principal Dancer with San Francisco Ballet. She was born in Moscow. Maria trained at the Bolshoi Ballet School for eight years before dancing with The Royal Ballet and English National Ballet in London. She joined the San Francisco Ballet as a Principal Dancer in 2007 and has performed as a guest artist with the Bolshoi and Stanislavsky Theaters in Moscow, the Mariinsky and Mikhailovsky Theaters in St. Petersburg, ABT in New York and the Tokyo Ballet in Japan. Johan Kobborg He was born 1972 in Odense, Denmark. is a Danish ballet dancer, choreographer, director and visual artist. He is most noted as a ballet dancer, having been a principal dancer with both the Royal Danish Ballet and the Royal Ballet in Great Britain, as well as making guest appearances with other international ballet companies. In June 2013, he announced that he and Cojocaru would leave The Royal Ballet at the end of 2012/13 season. Their last performance in London was in Mayerling on 5 June, his 41st birthday. Since leaving the Royal Ballet in 2013, he has worked freelance as a dancer, choreographer and ballet teacher. L’histoire de Manon is a ballet comprising the music of Jules Massenet, arranged and partially orchestrated by British composer Leighton Lucas, re-orchestrated entirely by conductor Martin Yates in 2011. The piece was first presented by The Royal Ballet in London in 1974, with choreography by Sir Kenneth MacMillan and it continues to be recognised internationally as one of the company’s signature ballets. Ironically, the ballet contains none of the music from Massenet’s opera Manon, with which it shares an almost identical story. The music compiled by Lucas is drawn from other works by Massenet, including thirteen operas and two oratorios as well as his orchestral suites, various songs and piano works. The ballet is a mainstay of the modern repertoire, generally referred to as simply Manon. Sir Kenneth MacMillan (1929 – 1992) was a British ballet dancer and choreographer. He was artistic director of the Royal Ballet in London between 1970 and 1977. MacMillan was born at Scotland. He won a scholarship to the Sadler’s Wells Ballet School, where he studied for a year before, in 1946, joining Sadler’s Wells Theatre Ballet, now known as Birmingham Royal Ballet. Whilst studying, he met and gained the support of Ninette de Valois, something he was to enjoy wholeheartedly for the rest of his life. In 1948 he moved to the Sadler’s Wells Ballet, but returned to the Theatre Ballet four years later. MacMillan began choreographing for the company’s choreographic group and two promising early works, Somnambulism (1953) and Laiderette (1954) led de Valois to commission a work from the 25-year-old MacMillan. Danses concertantes was first produced in January 1955. He continued to dance, but gradually gave it up in favour of his true vocation. A string of successful works followed including Solitaire (1956), The Burrow (1958), Le baiser de la fée and The Invitation (1960), The Rite of Spring (1962), La Création du monde (1964) The Song of the Earth and his first full-length work, Romeo and Juliet (1965). The year he choreographed Romeo and Juliet, which has become one of his best-loved pieces, he was appointed resident choreographer at The Royal Ballet. MacMillan was the director of the Deutsche Oper Berlin ballet from 1966 to 1969, and was made director of The Royal Ballet in 1970. He continued to choreograph and produced a string of masterpieces: Valses nobles et sentimentales (1966), Anastasia (one-act version 1967, three-act version 1971), The Seven Deadly Sins (1973), Manon and Elite Syncopations (1974), Requiem (1976), Mayerling (1978), Isadora (1981), The Prince of the Pagodas (1989) and The Judas Tree (1992). In 1977, aged only 48, he retired as director and took up the position of principal choreographer for The Royal Ballet. He was knighted in 1983.